Brandon Marshall, who played college football with Colin Kaepernick, took a knee during the national anthem before Thursday night’s game in Denver. There are now four black men who have deemed racial inequality in the United States grounds to protest an NFL tradition that has been become synonymous with the game itself. Across the league, flags stretching the width of the field are unfurled by dozens of grateful volunteers, and players are filmed and broadcast staring wistfully into the distance. Marshall’s former teammate, Knowshon Moreno, became the very image of NFL patriotism when he shed massive raindrop tears during the anthem before a 2013 game. • THE MMQB PODCAST WITH PETER KING: Like the Monday Morning Quarterback? Then subscribe to the new podcast from Peter King. On Thursday, Marshall doubled down on what Kaepernick, his former teammate at Nevada, has asserted since his initial preseason protest—that the opportunity to play in the NFL is not an excuse to forsake one’s conscience, but rather an obligation to maximize one’s voice. “I prayed long and hard about it and I felt it was the right thing to do,” Marshall told The MMQB after the game. “It is what it is; I’m standing up for what I believe in. I know my family will support me. Marshall only told a small circle of people he’d been considering following in Kaepernick’s footsteps. The Broncos didn’t know; not his teammates nor the coaching staff. His mother and sister, in attendance for the season opener, had no idea. Marshall would tell the throng of 20 or so media members waiting at his locker that he was still unsure as he walked onto the field for the anthem. When the time came, there was Marshall, beside teammates Jared Crick and Billy Winn, knee in the dirt with an arm resting on his thigh. Marshall’s mother and sister in the stands began receiving rapid phone calls and texts and were as surprised as anybody. Marshall consulted only with his cousin, Ennis, and close friend Jacob Wallace, who is safety T.J. Ward’s cousin. They warned him: Be ready for the backlash. Have your talking points ready. Tony Dungy and Rodney Harrison, two of the most prominent African Americans in pro football media, did not discuss the protest during NBC’s halftime program. Harrison, of course, apologized last week for saying Kaepernick is “not black” and thus unable to understand discrimination against black men. Marshall wanted to make clear in his post-game comments that he had arrived at the conclusion he should join the protest only recently, and that the gesture was not connected to the anniversary of 9/11. He plans to donate part of his $2.5 million salary in 2016 to charities that support veterans returned from combat. 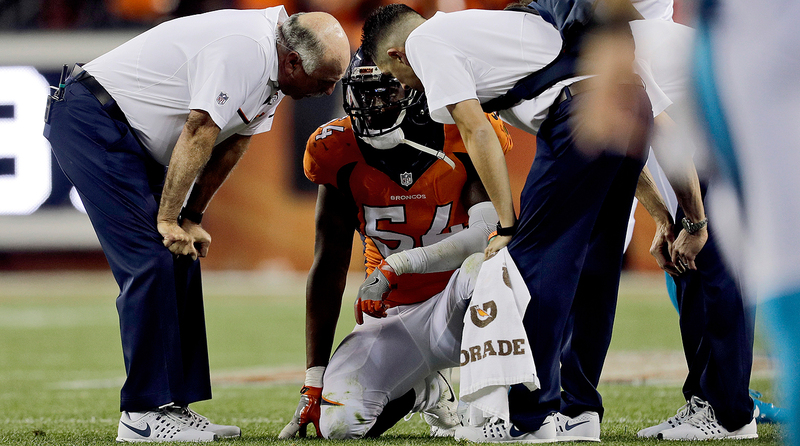 Marshall suffered a blow to the head against the Panthers and was evaluated by medical personnel. He eventually returned to the game. Though Kaepernick and Marshall are close friends, Marshall said he hadn’t yet talked to Kaepernick about the protest. His decision was driven in part by personal experience. This summer, Marshall said he was dining with friends at a restaurant within Miami’s Bayside Marketplace, an enclave of restaurants and stores near downtown. Diners heard gunshots outside and ducked under tables out of fear. Police entered the restaurant minutes later and asked patrons to leave. Growing up in Las Vegas, Marshall rattled off instances of what he believed was racial profiling. In college he’d been pulled over while wearing a hoodie and grilled about his destination. (He says the officer never mentioned any infraction). In high school, Marshall’s older brother was pulled over while Marshall was sleeping in the passenger seat. The police insisted the groggy and confused Marshall must be high and requested to search their vehicle. His mother had profiling stories of her own, which she imparted to her children as a warning. The hate arrived with every ping of Marshall’s phone in an empty locker room beginning at about 6:30 p.m. mountain time. When Marshall took a blow to the head and went through the concussion protocol in the first half, his detractors celebrated in his mentions. Marshall nodded agreement. Marshall figures they’ll have a conversation about what comes next, and he’s ready for that. But first he’ll get a good night’s sleep and wake up and read every text message, along with most of his Twitter mentions, no matter how cruel. “You can’t hide from it,” he said.